In the early twentieth century, the field of anthropology transformed itself from the "welcoming science," uniquely open to women, people of colour, and amateurs, into a professional science of culture. The new field grew in rigour and prestige but excluded practitioners and methods that no longer fit a narrow standard of scientific legitimacy. In Rhetoric in American Anthropology, Risa Applegarth traces the "rhetorical archeology" of this transformation in the writings of early women anthropologists. Applegarth examines the crucial role of ethnographic genres in determining scientific status and recovers the work of marginalised anthropologists who developed alternative forms of scientific writing. Applegarth analyses scores of ethnographic monographs to demonstrate how early anthropologists intensified the constraints of genre to define their community and limit the aims and methods of their science. But in the 1920s and 1930s, professional researchers sidelined by the academy persisted in challenging the field's boundaries, developing unique rhetorical practises and experimenting with alternative genres that in turn greatly expanded the epistemology of the field. Applegarth demonstrates how these writers' folklore collections, ethnographic novels and autobiographies of fieldwork experiences reopened debates over how scientific knowledge was made: through what human relationships, by what bodies, and for what ends. 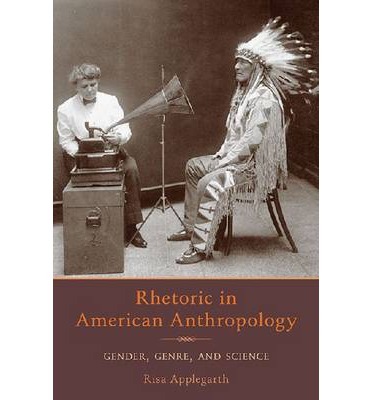 Linking early anthropologists' ethnographic strategies to contemporary theories of rhetoric and composition, Rhetoric in American Anthropology provides a fascinating account of the emergence of a new discipline and reveals powerful intersections among gender, genre and science.